Columns Bagua in My Bedroom? I live in a house with two levels. I have my bedroom in the second level. The bedroom is accessed by stairs and they are on the left side of the main door of the house, that is on the Knowledge area – I guess. I don’t know if I should consider the stairs as the main entrance of the bedroom or still use the main door of the house as a reference point. I have also tried to use a compass to find out for example where the Relationships area is. In theory, it is in the southwest part of the house. But when I use the bagua and use it according to the main entrance situation, the result is completely different. Could you help me with this? Thank you very much. 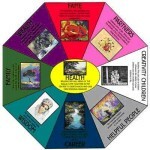 Please contact me again this weekend to let me know if you are using Black Hat Feng Shui or Compass school? It can be confusing having different books giving different ways of mapping your home. As a consultant, I have found the system which works best for the novice is the school of thought which aligns the Bagua or 8-sided octagonal shaped grid. Master Lin Yun brought this school of Feng Shui to the United States in the early 80s. His teaching of this ancient form of harmony and balance began at Berkeley, California. His schooling began at age five in China, and the world has never been the same. When attending his classes, I witnessed his humility, spiritual awareness and honesty when presenting Feng Shui to Americans. My newspaper column called West Meets East, archived from the Benicia Herald, can also be read on my website. The archive contains more than 100 stories and teachings to help inform and answer questions pertaining to Black Hat School of thought. Many of these might answer your questions. Black Hat School can be used without the compass and provide excellent results. I began my career using Compass School, which works very well also, but is complicated for the client. My goal was to educate the client, so the client could take control of his or her life with the diagram or floor plan of their home or office after I left the home. Each of my consultations became a private lesson. This is a very empowering gift for the owner of the dwelling. Next, there are two options at the top of the second story. In Master Lin’s early teaching, the second level was considered a second and new Bagua alignment, and in this second phase the Career zone started at the top of the stairs. Although this mapping is still used by many consultants with success, I find Terah Collins, author of many Feng Shui books and a San Diego school, advice quite helpful. Terah’s idea is, as below so above. (She is also a past student of His Holiness and follows many of his teachings.) This system also works very well on homes with multiple stairways. During one of Master Lin’s workshops, I heard him contend, yes, the second floor could be considered as below so above. He feels the Bagua is a part of your being, and this invisible energy or Chi is always changing and always flowing. Life is never the same from second to second, and we must adjust to the Chi’s changing and life forces. The Bagua can be placed over the home, car, boat, property, the body, the face and the nation. Choose your consultant wisely and ask questions. If someone suggests a doorway be boarded up or tells you must follow their advice only and predicts scary situations, run, don’t walk to a known and proven consultant. Good Luck! PS: I am available consultations by email. This service can be done by fax and phone with an appointment.